The disaster-relief agency, under fire after Hurricane Maria, won’t release the plan, even as a comparable document for Hawaii remains public. The plan, known as a hurricane annex, runs more than 100 pages and explains exactly what FEMA and other agencies would do in the event that a large storm struck the island. The document could help experts assess both how well the federal government had prepared for a storm the size of Hurricane Maria and whether FEMA’s response matches what was planned. The agency began drafting such advance plans after it was excoriated for poor performance and lack of preparation in the wake of Hurricane Katrina in 2005. ProPublica requested a copy of the Puerto Rico hurricane annex as part of its reporting on the federal response to Maria, the scale and speed of which has been the subject of scrutiny and criticism. More than a month after the storm made landfall, 73 percent of the island still lacks electricity. Early last week, a FEMA spokesman said he would provide a copy of the plan that afternoon. It never came. After a week of follow-ups, FEMA sent a statement reversing its position. “Due to the potentially sensitive information contained within the Hurricane Annex of the Region II All Hazards Plan, there are legal questions surrounding what, if any, portions of the annex can be released,” the statement said. “As such, the documents that you seek must be reviewed and analyzed under the Freedom of Information Act (FOIA) by FEMA.” The statement did not explain what legal questions apply. As ProPublica has previously reported, FEMA’s Freedom of Information process is plagued by dysfunction and yearslong backlogs. For example, FEMA hasn’t responded to a request for documents related to Superstorm Sandy that we filed more than three and a half years ago. 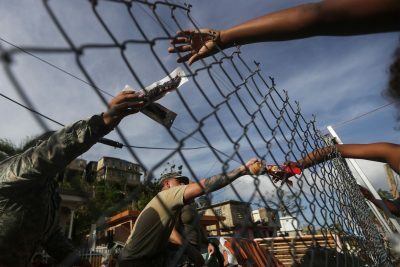 Do you have information about FEMA or other agencies’ responses to Hurricane Maria in Puerto Rico? Contact Justin at [email protected] or via Signal at 774-826-6240.